Mosquitos the size of hummingbirds! Mosquitos the size of hummingbirds! 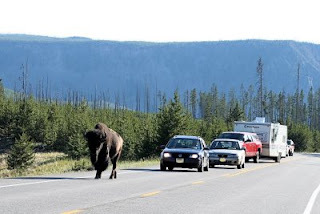 Welcome to Yellowstone. 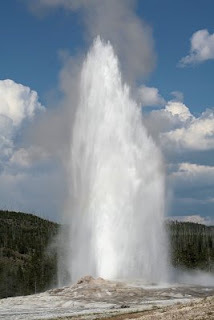 We've bragged all summer about how wonderful Yellowstone National Park and West Yellowstone is...in full disclosure, we have to acknowledge one drawback! Mosquitos...they're huge and when they bite, you're doomed to itch for days. If it weren't for Afterbite http://www.tendercorp.com/faq.php?cat=2 , we'd never survive! Gotta go...Estelle and David are on their way to play canasta!!! will let you know tonight who won! GIRL POWER! 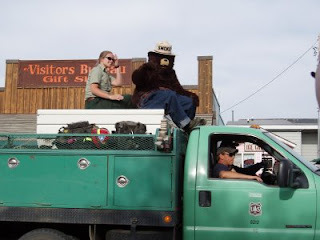 Our best meal in Yellowstone! The best meal we've had since we arrived in West Yellowstone in May! 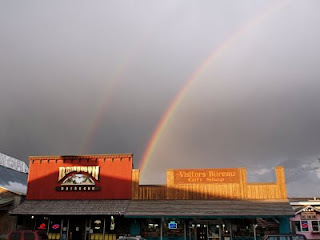 We ate last night at the Yellowstone Hotel and the food was superb...far better than the Old Faithful Inn or anywhere we've eaten in town. 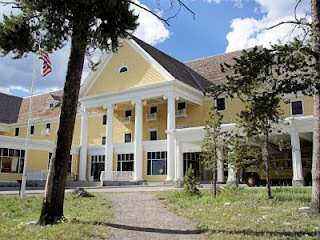 The hotel was built in 1891 on the shores of Lake Yellowstone, it originally was a railroad hotel. With renovations, the hotel you see in this picture emerged! The view out of the dining room is beautiful! Last night we kept waiting for Patrick Swayze and Jennifer Gray to dance into the dining room. It is so reminiscent of "Dirty Dancing"! Right down to a string quartet in the sun room. We did have one setback...a man pulled out of a parking spot and backed his car into the side of the mustang! You know that's Woody's baby but he managed to keep his cool...well, fairly well anyway! When we called his State Farm agent, he had already called in the claim. Great to know there are honest people still left in the world! We have State Farm too...they've always been great! We spent today running errands and getting presents ready to mail for birthdays! Our friends Bill and Jane sent us the most wonderful care package from home! Tonight we had white beans, corn muffins, country ham and biscuits...yesterday we polished off the RoC cola and moon pies...oh and don't forget the goo goo clusters! I may not love Jane later tonight! It's amazing how easy it is to cook beans in a crock pot! We also bought a toaster oven. We don't like to use propane because we pay for that and electric is free! You know we are retired and watching our pennies! Right! I'm still knitting...watch your mail! Have a great rest of the week!! We had a great week and a better Sunday. 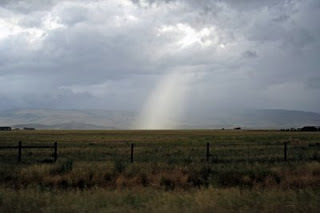 We drove south of West Yellowstone into Grand Teton National Park. 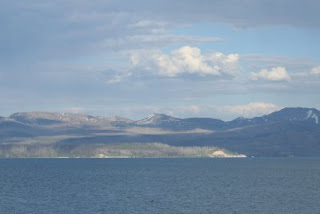 Just a precursor to a trip to Jackson, WY in August. 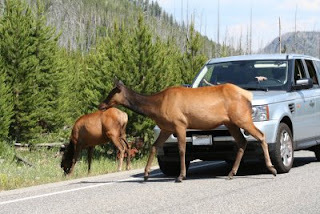 We did hit rush hour in Yellowstone on the way! Guess who has the right of way! 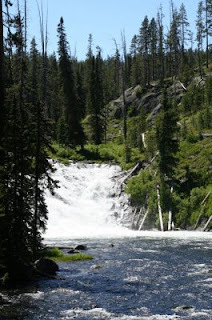 A bit of hiking to the top of Lewis Falls and lots of fabulous looks at the Lewis River leading to the Snake River. The most fun was tracking a young coyote who stalked the elk you see here! He didn't stand a chance at bringing one of these guys down, but we tracked him for a good while and watched him head downwind of the herd until he finally went on down the river! 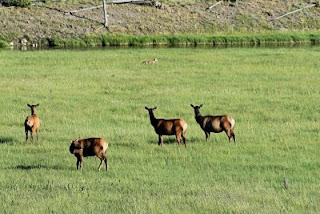 The elk were peacefully grazing until they caught a whiff of the coyote! Up popped the heads! 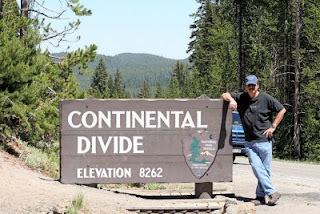 Here's Woody standing on the Continental Divide at Lake Issa. 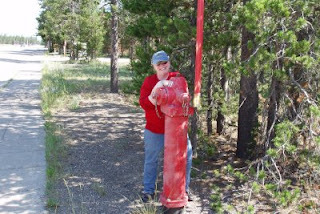 It is the high point of the continent and one half of Lake Issa drains to the Columbia River to the west and the Pacific, and the other half drains into the Missouri and Mississippi into the Gulf of Mexico/Atlantic! Woody was just totally impressed with the fact that he was standing on the high point of the divide! We've decided that five months away from home is too long, so look for us to take shorter trips. We miss the kids and grandkids (of course they could come see us! ), the breakfast buds and our wonderful neighbors. We also miss shopping at WalMart! It's 89 miles to WalMart and gas here is almost $4.50 a gallon! The tourists are down, but it's still busy. We've had 35 states represented in our customers and about 30 countries...we're playing the license plate game without cars! I am loving the store and our boss...we're just having a blast! 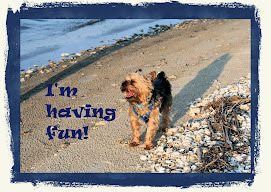 Some of the pictures here on the blog are selling as photo cards at Buffalo Trading Company. Several are going out of the country so I'm truly an international photographer! Brenda ordered a photo album to sell and one of my shots is the cover! Guess what you'll all get for Christmas!!! Woody is sleepy and said we had to sign off for now! Have a blessed week! 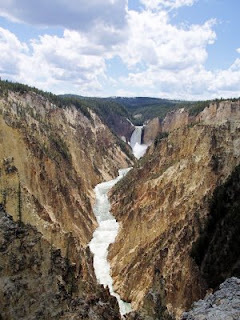 See the waterfall that runs through the Grand Canyon of the Yellowstone National Park...just wanted you to have a little taste of nature before sharing with you our 4th of July!! 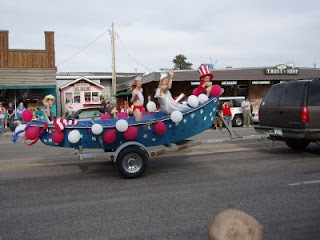 We had a blast watching the 4th of July Parade down Canyon Street in front of our shop in West Yellowstone, Montana! Here are the pictures that celebrate Americana at it's finest! The double rainbow was just after the parade! We missed the fireworks because we couldn't get all the people out of the store! It was our busiest day. Last week I did a little consulting gig in Kansas and fell in love with the Bozeman airport! It's fun to fly out of the little airports! Still had a little jet! Today was a full day in Big Sky, Montana! 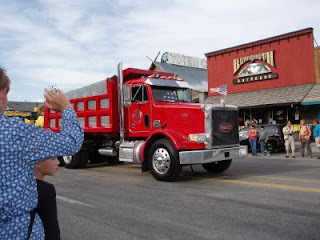 http://www.bigskychamber.com/ I've decided I could live in Big Sky! We went to a little artist and crafts fair in Meadow Village. It was a little sad that only about 12-15 artisians were at the Crail Ranch. 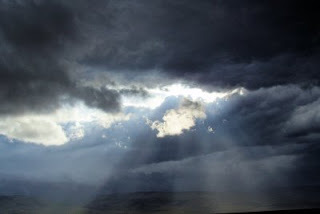 After our TACA art fairs, we were a little surprised. The Big Sky Resort http://www.bigskyresort.com/ area is fabulous though. Tons of ski slopes which I think equates to snow and winter! We saw a sign that said that Montana has three seasons...last winter, this winter and next winter! I think I'm now a summer mountain girl! I'd still have to leave for most of the winter. 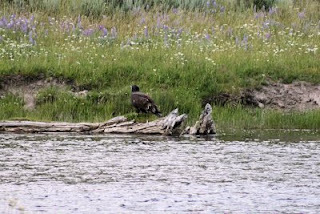 We're still enjoying our time here...the animals are getting a bit more elusive as the weather warms up...we're heading south toward Jackson Hole and the Tetons tomorrow. We still have plans to go for three or four days but we're waiting til late August when more of the tourists leave! Since we have a post office box, we're not tourists!! !